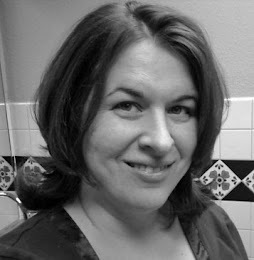 Libby's Little Addiction: The Hero Arts 2019 Catalog Blog Hop + Giveaway! The Hero Arts 2019 Catalog Blog Hop + Giveaway! Hello! I am hopping along with Hero Arts today, to introduce all of the wonderful goodies that were introduced in the new 2019 Hero Arts Catalog - and now available in the Hero Arts store! Today's post is all about butterflies! I wanted to share some of the fabulous new butterflies in this release, specifically the Nesting Butterflies Infinity Dies. This is a set of six butterfly dies in various sizes, plus some antennae dies, too. There are so many things you can do with this die set! 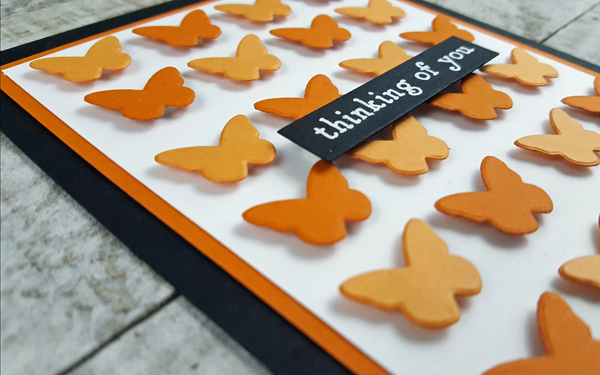 For this first card, I used the tiniest butterfly in the set, and cut it out repeatedly using the GORGEOUS new cardstock in both Papaya and Pumpkin. (Can I just pause for a moment and tell you just how INCREDIBLY EXCITED I AM about this new cardstock??? It's my favorite new thing in this release by far! If you've used the Hero Layering Paper in the past, you know what a huge change this is!) Attaching all of the butterflies to this card with foam tape was a labor of love. It's all on a panel of Dove White, which was in turn mounted on more Pumpkin then Pitch Black. The message is from a fabulous new little 3x4 message set - Hero Greetings Sending Smiles. This next card again uses the Nesting Butterflies Infinity Dies. This time I used a little larger butterfly from the die set, and layered the butterflies together. The gorgeous blue cardstock is called Paradise, and I layered a vellum butterfly on top using just a small line of the fabulous new Precision Glue along only the center. The line of glue was hidden with gems. And that spectacular background? That's a new background stamp called Ocean Waves Bold Prints. I embossed it with Sparkle embossing powder on Sand cardstock for a subtle background. 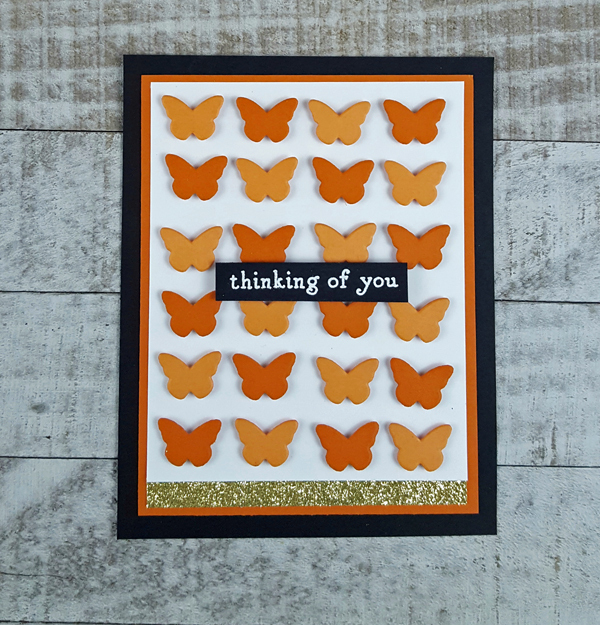 The message on the card above was from the gorgeous new Color Layering Monarch Butterfly set, which I believe you've seen on other cards in this hop. There's also the New Day Butterflies stamp set in this release, as well as a Monarch Butterfly Fancy Die. And now, let's get hopping! I was the last stop on today's hop, but be sure to go back and visit all of the blogs! We're giving away FOUR (!!) 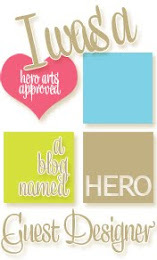 $50 gift certificates to the Hero Arts store - you don't want to miss your chance to win! Comments close on Sunday February 17th at midnight PST, so get to hopping! Your cards are just beautiful! Thanks for inspiration! Two beautiful cards, especially loving the first one with all the butterflies! Thank you for the wonderful inspiration! Your butterflies are so cute! I love the little tiny butterflies. TFS! I love all of the ways you used the butterflies in your cards. Thank you for sharing! Such pretty cards! Loved the multi-butterfly one but then swooned over the Butterfly Wishes. Such cute butterflies. Thank you for sharing. I really like the orange butterflies. Orange is my favorite color now, and I enjoy seeing it everywhere! Beautiful butterfly cards..Love both of them..especially the first one..
Love the butterflies. Thank you for the opportunity. OOOOO Those butterflies are SOOOO COOL! I love your designs! i like the vellum overlay on the butterflies, darling. I am really liking the ocean waves stamp. Wonderfully happy and sweet cards! Lovely designs. Ooh, I really like the vellum layer on your butterfly, and that Ocean Waves background is going to be on my wish list! These butterfly cards are just beautiful and I love them paired with the ocean wave background! Love the butterflies! and those new colored papers look terrific! I always use butterflies on my cards, they remind me of spring. Pretty butterflies. Great use of the images. I love your butterfly cards! Butterflies make every thing cheery. Awesome cards. Lovely designs Libby. The butterflies are so pretty and the background tamps are must haves. Thanks for the inspiration! Great new products! I love your creations, especially the kraft & blue card! Love the card with the tiny butterflies! I love both of these cards. The butterfly card is simple, but elegant. I'm enjoying going through my catalog, making up my wish list. So many nice things! Thanks for sharing Libby! Hero Arts is one of my favorite companies, and this release is wonderful. Love your adorable cards! My favorite from this release is the New Day Butterflies. Love clean and simple cards and this new HA release! Can't wait to get a catalog! Butterflies rule! 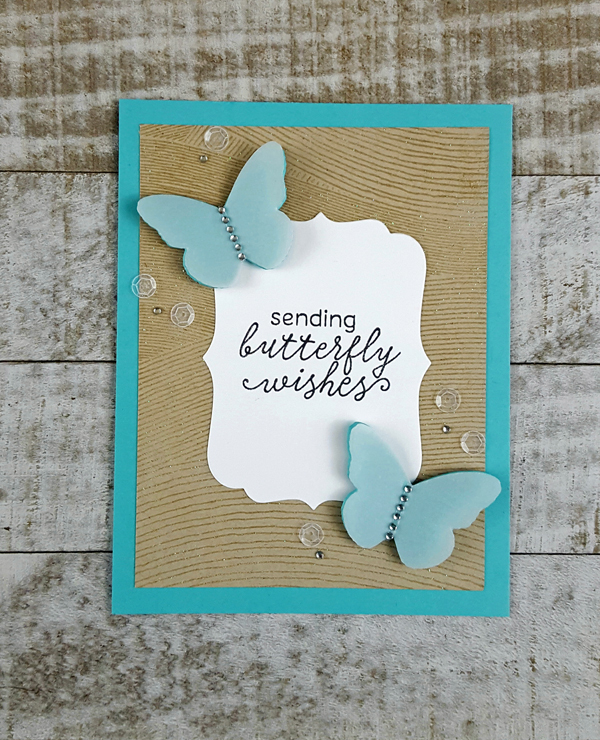 Not only do I love all the butterfly products in this release, I am excited about the new card stock colors and love seeing them in use in this hop. Thanks for sharing your gorgeous cards! Great cards Libby! They perfectly showcase the new release from Hero Arts! 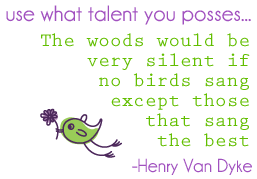 Thanks so much for sharing and your wonderful inspirations! Wonderful cards!! Great use of the new release from Hero Arts!! Can't wait to see the catalog!! Fun cards - simple and elegant - thank you! Such a pretty use of all the different colors of card. Thanks for sharing your lovely cards. I love your pretty cards! Lovely cards! Love the colors of the second one especially and those layered butterflies are so pretty! Loving the use of the Ocean Waves stamp. Nice work! Pretty cards!! Love the color combos you used! Butterflies.....in stacking layers - priceless. Your cards are beautiful and I can see where - the labor of love was true with the mini butterflies and tape :) Very nice and thank you! Hero Arts did a great job with all the products in this catalog. Will be shopping for sure, already have my list started. Awesome butterfly cards. Love nesting dies! Very pretty cards. The wave stamp is so versatile. So far I've seen it as waves, air currents and if it was small enough I think you could use it as woodgrain! Thanks for sharing. I just love that papaya cardstock!! Gorgeous, I love the idea from the first card. So simple but so stunning! Your second cards with the Ocean Waves Bold Print background stamp embossed is absolute fantastic! The gorgeous two layered butterfly as well as the background are a perfect match with each other. Thank you so much Libby for your beautiful cards and inspiration. Have a great weekend. I really like the ocean waves background stamp with your butterfly card.Nice texture. I love the cards, especially the background stamps. I really like the vellum butterfly on the front on the cards also. Love your use of color on the first card and the way you used the background stamp on the second. Enjoyed your ideas! Charming butterfly projects Libby! Thanks for sharing these clever ideas! You make the new products look so amazing!! Butterflies everywhere!!! LOL....I love butterflies...these cards were right up my alley. Thank you so much for sharing them today in this fun blog hop. Butterflies everywhere. I love them. Great cards. Thanks for sharing your beautiful cards and for the inspiration. What a great blog hop and wonderful new products from a great company. Hooray for Hero arts. 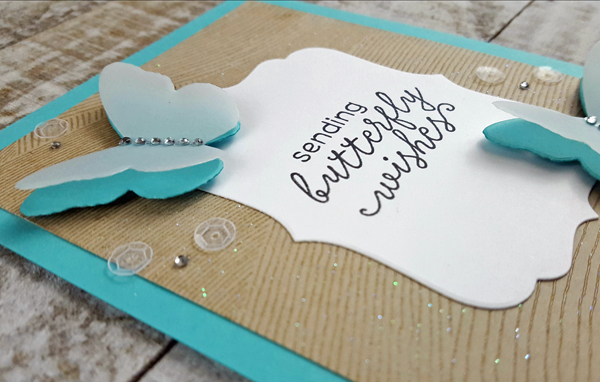 Lovely designs using the new butterflys and Ocean Waves background. And the cardstock looks amazing, too! I'm in. Until now, I have not considered myself a butterfly gal. I'm in! Love all those butterflies! Beautiful cards! The vellum butterflies are gorgeous! I love how it adds such a softness! Cute card designs! It must have taken some time to line up all those little butterflies (and they look perfect). I like the vellum wings and tiny gems on the larger ones. Love all the butterflies, especially the vellum over bigger butterflies. I love how in your first card you took chromatic colors to set up your theme..... Beautiful! Such pretty cards! I love butterflies! Cute cards! I love butterflies and these are very versatile. Excited about the cardstock too. I love the design and the colours you used on the first one. Beautiful last post of a great blog hop ! Wonderful uses of the butterflies. in the second card is great. Very pretty butterfly cards! Thanks so much for sharing. I don't own any butterfly dies but was tempted after looking through the new catalog. Now, I'm for sure getting the nesting die! These butterflies are just lovely, the background on your second card is so fab. I love your creative use of butterflies! I can never get enough of them. Wonderful cards! Such great designs! Wonderful cards. I love the vellum over the butterflies on the second one. Fantastic cards. I love the butterflies on the first card! Such a cute design. I love how you kept the butterflies simple and pretty, because they make such a impact in your design! These cards are fantastic! Oh the vellum on the butterflies are a great touch! Thanks for the inspiration! Cool use of the butterflies! Your cards are lovely. I really like the ones that you layered with vellum. I love bling so those butterflies really appeal to me. What a lovely use of the butterfly dies. I too am excited about the new Card Stock! Thank you for showcasing it!